The past 21 days have been some of the most intense hacking days that I have ever had and the same goes for my team that worked 12 to 16 hours per day every single day --including weekends-- to implement Silverlight for Linux in record time. We call this effort Moonlight. Needless to say, we believe that Silverlight is a fantastic development platform, and its .NET-based version is incredibly interesting and as Linux/Unix users we wanted to both get access to content produced with it and to use Linux as our developer platform for Silverlight-powered web sites. Am now on a flight to Paris to show the results of 20 days of intense work that the team has implemented. It is hard to contribute to the effort sitting on a plane when the tree is changing every 10-20 minutes. There is technically still some time left to improve what we can show. You can see our screenshot-log to see our progress or the Moonlight Project Planning Page. At this point we do not have a packaged release of Silverlight for Linux and we still have to sort out a few things that would have to be done in order to ship a ready-to-use plugin. But if you are curious or want to contribute to the effort check our page for information on downloading, compiling and getting started with the project. Progress on the Silverlight Airlines, June 20th. At the Mix conference this year, after the open source panel, I had a chance to meet with Marc Jalabert from Microsoft France who invited me to participate in a re-play of the Mix event in Vegas, this time in Paris. We suggest you speak during the conference keynote and show a preview of moonlight if you already have something to show. But on the 31st, other than having learned about Silverlight, explored how to decode video, experiment a little with video and started planning for an implementation we had nothing to show. Nothing am telling you. Also, May was a busy month for me HR-wise as we were hiring new developers to join the Mono team. very little time to get things in shape. and I think it would be foolish not to take advantage of this. animation, to avoid doing the full animation framework). basics (like doing data type conversion). rendering) and the video (without audio) I got nothing. that we can use the same model that Mike used for Gtk#. is determined by C#, not by C++, but you get the idea). the grounds of hardware acceleration). participate in an intense two-week hackathon to make it happen? We modified the Silverlight Surface demo to show a live clock and the Mono Logo. The team was assembled quickly in response to the email, a limited group from the Mono team to avoid having too many coordination conflicts. but I have heard about that Cairo-thing. without the words text or tree in it. I am down with the dope! Jeff's first task would be to fix audio in the media player. He would eventually rewrite the video playback engine so we could provide Video brushes in all of its glory and implement the audio support. Jackson started work on the Expat-based XAML parser (we wanted to use a small XML parser so we can eventually make this a small download as well). Everaldo started work on the browser plugin. At this point I got the feeling that "DependencyObject" and "DependencyProperty" might be playing a role more important than I had originally thought of. My initial reaction to DependencyObject was a mix between "ugh" and "its kind of clever". At the time it seemed important, but did not quite grasp its importance, I asked Rolf (of Visual Basic compiler in Visual Basic) fame to take over that. Eventually we would end up with a complete type system and I would describe if it wasn't for the fact that it is still changing and being refactored. Our "Value::Kind" enumeration just vanished and became part of our "Type" class in a valiant effort by Rolf to clean up the code base. Chris Toshok started work on timelines, which as a dependency required him to start work on transformations as well. He would later take over the entire animation, clock, and frame rendering infrastructure pieces. The rest of the Mono team was charged with keeping an eye on the rest of the project, continue to fix bugs and provide us with cover for our fresh project. They also would help when we ran into problems (like helping out with performance on Monday the 18th when we were things were not looking great for the Surface demo). In addition other Novell employees (Atsushi Enomoto, JB Evain, Marek Safar and Mark Probst) are indirectly working on Moonlight. JB by improving Cecil and his Linker (originally funded by the Google Summer of Code, thanks Google!) that would allow us to shrink our existing assemblies into assemblies that would be identical to the Silverlight ones. Atsushi has done most of our WCF platform, JSon serialization, Marek by implementing LINQ for our C# 3 compiler and its underlying infrastructure and Mark will be working on the JIT support for the new Silverlight security system and of course everyone else in the Mono team that continues to improve our runtime. Various members from the Mono community have also contributed to Moonlight directly or indirectly through their contributions to the Olive sub-project: Stephen, Joel, Olivier, Antonello, Marek and many more am missing. My original plan was to write the low-level rendering engine in C and expose some sort of "scene" API that the managed world would control. With only a few primitives and a handful of operations on those primitives this idea sounded passable. The first code checked into the tree was written in C with the usual Gtk+-like programming pattern and a glib-like object system. The early tests of Silverlight content rendering side-by-side with SVG content. There were a few factors that altered the design: the advice from Scott Guthrie and Jason Zander during my trip to the Compiler Lab; David Reveman's  (the wizard behind Glitz, Xgl and Compiz) suggestion for moving the engine into the compositing manager and early changes to the class hierarchy that moved me away from C.
I discussed with Scott Guthrie and Jason Zander that I wanted to do as much as possible in managed code, but they made an interesting observation. XAML content might have a few thousand objects defined here and there, but most applications would only care about a couple of high-level objects: a handful of buttons, handles, animations, and so forth but it was not worth having all of those objects in managed memory and for a graphics intensive system we wanted to minimize the number of managed to unmanaged transitions. The above being said, in 20 days we really had no time to implement two versions and compare whether these assumptions were correct or not. The other consideration to move away from C# to C at the time had to do with the early conversations with David Reveman who wanted to hardware accelerate this. The idea was to turn the Silverlight high-level operations into a scene description that we could transfer from the client applications directly onto the compositing manager (On modern X installations this is what actually puts the bits on the screen and what has enabled all those spicy effects like the rotating cube). The idea here is that the Silverlight client could detect if it was running under a compositing manager that offered rendering on the server and it would off-load all the rendering to the layer that can talk directly to the OpenGL hardware. As the hack-a-thon got started and I started introducing a C-virtual function here and a C-virtual function there, the second time I had to change the hierarchy I got annoyed, bit the bullet and moved the code to C++. We kept our use of C++ features to a bare minimum, it helped us in quite some cases and in some other cases we hated it. A proper rant about C++ will have to wait for another day. At least we stayed within the confines of the "C" family of languages. David Reveman is one of the main wizards behind the graphics revolution going on in Linux: Glitz, Xgl and Compiz. He also happens to be based in the Cambridge office and host an international crowd at his fabulous apartment for drinks. The project was originally organized over email but the day-to-day technical discussions moving into a private IRC channel. We did use email as a way of communicating with some of the developers on other time zones to either pass the baton and as a poor man's bug-tracking system. We did have a handful of one-to-one phone conversations when we started to merge things together: some components were independent of each other and due to the hacking intensity during this period. The crowd in America would go to sleep and Atsushi (Japan) and Rolf (Spain) would take over development for the next eight hours until we were able to catch up again: Everaldo in Sao Paolo, Sebastien in Canada, Jeff, Alan in Boston and later Jackson, and myself on the East Coast (due to our sleeping hours) and Chris on the West Coast. This is basically how we do things in the Mono team, except this time we were under tight pressure. The .NET API to Silverlight shipped with very little in the form of documentation, but a lot of it could be inferred from the Silverlight 1.0 API and from the WPF API. The Silverlight .NET API is a flatter API than WPF is, but in some cases (the work that Chris did on animations) we would internally on the C++ side implement some of the classes that are found on the bigger brother of Silverlight as support infrastructure for it. The API reference that we used was what was available on the Visual Studio Object Browser (or Mono's equivalent command line tool: monop). Alan McGovern (of BitSharp fame) would be arriving to Boston a week after the hack-a-thon and we asked him to start work on a Silverlight-based designer and on bits of the C# API (exercising our C++ code). At this point the class hierarchy was no longer the "early" check-in that was more focused on "scenes" but instead mirrored the C# API one-to-one. Also, the type system had been in place and we had to come up with a mechanism to provide the equivalent to object identity and boxing to communicate between C# and C++. Keeping the two sets of typecodes in sync had become a source of frustration which lead to Chris and Rolf to write some sanity checking scripts and auto-generate one from the other. During this week the C# binding came to life. We had been doing all of our work in C++ and testing every new class by sticking the new object, brush, opacity setting, transformation, animation, storyboard and flag into a single demo. One ugly demo with CNN and the Colbert Report spinning on the background. The object system was designed with reference counts in mind, similar to The GObject system and also has the notion of "sunk" references. By the end of the week we had not really paid much attention to proper object management and ownership and problems started to creep up when we had to properly shutdown (say, when loading a second XAML file in the same Surface that might have been animated). everaldo gets plugin using <object> embedding instead of the hack we were using. Made 1,228 commits to the SVN repository (Everaldo was the lucky commiter for revision r80000 in our tree). Wrote 1,367 lines for the C# binding to Gtk# and the Mozilla C# host. Pango for doing text rendering. The team background and familiarity with Mono, C#, C, C++, Gtk+, X11, Cairo and Pango. Valgrind. Best C/C++ debugging tool in the world. When the bugs get nasty Valgrind was able to pinpoint the problems while we mixed Mozilla, Mono, Cairo and our runtime library. Cairo performance, we probably need to learn how to better employ Cairo, but there are some bottlenecks in there that are quite bad. Alternatively we can mix rendering with Cairo with rendering with Antigrain (shared RGB buffer) or we could explore replacing Cairo with Antigrain. Cairo does not offer options to render the end cap and start cap differently. Cairo needs to offer an "alpha" enabled version for sources, not only "_set_source_rgba", but allow the "a" to exist for patterns and sources. Rotated text looks terrible and even miss-aligned. Antigrain has a "round-off" mode that makes these rendering glitches go away, it would require us to port pango-cairo to use Agg though. See what it looks like. Ligatures do not seem to be implemented, this is a problem for rendering arabic strings as it renders each character in its standalone form instead of the linked way. Pango does this, but we could not figure out why it does not work with Cairo (see image showing Linux spelled in Arabic). I did not think we would be able to get this far in 21 days, I was hoping at most to have a simple XAML file loading and some animations going but the team really achieved an incredible project . I think we are still quite impressed that it could be done. But there is still much work left to do to before we can work flawlessly as a Silverlight plugin. There are still some important chunks of work missing: from ensuring that everything we have implemented is complete to completing large chunks of work that are still missing. One of the major areas that needs work is the C# to browser integration as well as improving the browser plugin which only recently started working. Some work has been done (all on our public SVN repository) but the pieces came in too late to be integrated. We have a to-do list for some of the remaining tasks. 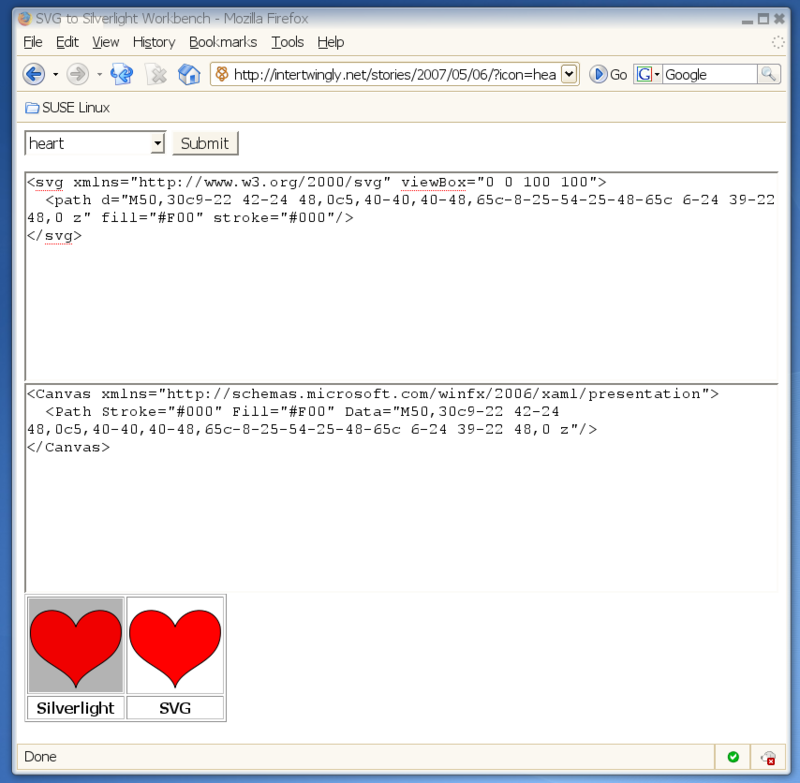 Although Silverlight is intended to be used in a web browser we think it would be very useful to Linux desktop programmers to have Silverlight reusable as a widget. We already have been talking to a few folks about how we can help them improve and spice up their desktop applications with Silverlight. Obvious choices are all the existing Gnome/Mono based applications, but ever since we got started on this, the idea of writing a "Media Center" sort of UI has been making the rounds. I have for years talked about my desire of having a "Flash on a Widget" widget for Gtk+, an idea that was not very popular back in the days when Flash was considered only a technology to do animations. We finally have such a widget and it can be scripted, hosted, embedded or extended from any ECMA CLI compliant language: all the traditional static languages for .NET as well as the new batch of dynamic languages that take advantage of the Dynamic Language Runtime (DLR). He also has this mode printing PDFs already. Currently we are using the fantastic ffmpeg video library but for the sake of distribution in some countries we might have to write a new video/audio backend. Novell will be requiring copyright assignments or contributions to be made under the MIT X11 license to Moonlight to ensure that we can ship this plugin with proprietary drivers if necessary (and also to relicense Moonlight for embedded system users). Allowing Linux users to develop rich user experiences in Linux without having to learn XAML by memory or requiring a Windows machine with Blend to design UIs. To integrate this directly into our MonoDevelop IDE so people can create web sites using Silverlight (Michael Hutchinson of aspnet-edit, another Google SoC graduate will be joining us in September). By developing Silverlight in Silverlight we will also allow the MacOS crowd that currently can consume Silverlight content but not produce it to participate in the production ecosystem. We need a logo for the Moonlight project, so we can print T-Shirts. If you want to help on the effort, the best thing to do is to get the source code, instructions are here and post your questions or suggestions to the Mono Olive discussion group.